Find Mii as it appears in Smash. Alternate: Save the World, Heroes! Find Mii (すれちがい伝説, StreetPass Legend), known as StreetPass™ Quest in PAL regions, is a stage that appears in Super Smash Bros. for Nintendo 3DS and Super Smash Bros. Ultimate. The stage has two main platforms; a larger, flat ground on the left, and a smaller, raised piece of ground on the right with a large gap in between. Occasionally, the Dark Emperor appears in the background, then later comes to the stage, or retreats back to the background. While he is off the stage, the Dark Emperor will occasionally provide an upgrade or downgrade to all characters wearing a specific color of costume (shown in pulsating lines at the top of the upper screen); when this happens, a notification appears in the bottom screen detailing who was affected and how. In Ultimate, due to having one screen, the status effect is displayed above the character, with an icon on what stat has upgraded/downgraded. Occasionally, he will fly into the foreground, damaging those he touches. After taking a certain amount of damage, he becomes defeated and flies back into the background, awarding the player who defeated him with a temporary stat boost. At times he can also make one of the two platforms temporarily sink into the abyss. A caged prince or princess Mii is positioned above the left platform. This cage is solid: it can be stood on and characters can rebound on its bottom and sides when launched. Attacking the cage makes it swing it around, and when hit enough times the cage breaks, launching the Mii off into the distance with a pseudo-star K.O. The cage later reappears, containing the same Mii. Releasing the Mii in this manner will make the Dark Emperor leave the battle earlier than usual. In Super Smash Bros. for Nintendo 3DS, the Ω form of this stage has a single platform with walls that extends below the blast line and resembles the main platform of the normal form. No Dark Emperor nor caged Mii appear. In Super Smash Bros. Ultimate, the Ω form and Battlefield form are similar to SSB4's Ω form; however, the main platform is resized and reshaped to match Final Destination and Battlefield, respectively. The platform also does not extend below the blast line; it now floats in place. The three soft platforms of the Battlefield form are metallic and are unique to this form. The stage is based on the final area in Find Mii II / StreetPass Quest II, known as the Castle of Darkness. At the beginning of the game, the player's Mii, who is the ruler of a kingdom, is captured. He is imprisoned in the Castle of Darkness, guarded by the Dark Lord or Dark Emperor (depending on the quest). In the normal quest of Find Mii II / StreetPass Quest II, the final boss is the Dark Lord, who is fought at Castle of Darkness - Sky Tower; in the Secret Quest of Find Mii II / StreetPass Quest II, the final boss is the Dark Emperor, who is fought at Castle of Darkness - Roof. The platform layout of the stage is identical to how the Castle of Darkness appears on the Find Mii II / StreetPass Quest II world map. In Find Mii II / StreetPass Quest II, the Dark Emperor himself does not use magic based on the twelve Mii colors. This concept is taken from the player's team of Miis - each Mii color has access to a different magic spell, varying from direct attacks to applying status effects, some of which are mandatory for progression in the game. 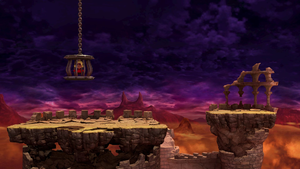 In Ultimate, the sky is more darkly colored like Mirage Tower - Summit, the area's parallel in the original Find Mii. A close-up of the Dark Emperor. The Dark Emperor along Villager and a Mii Brawler. The Mii Fighters following three Pikmin on the stage. The Dark Emperor behind Pit on the stage. Samus throwing Mega Man around the stage. Panorama of Find Mii from Ultimate. This is one of the several non-Stage Builder stages that allows Final Smashes such as Great Aether and Omnislash to turn into suicidal KOs, by sending the user and victim straight to the bottom blast line. This can only occur once the Dark Emperor causes the main platform to sink, but the Final Smash must be activated before the platform is fully offscreen, since doing it too late will result in the fighters being transported above the remaining small platform. Sending the Mii cage flying before or during a time-stopping event (such as a Final Smash) can rarely make the respawned cage glitch out and constantly attempt to reposition upwards, causing the cage to wildly swing in circles. This page was last edited on April 16, 2019, at 05:26.